And it really gets frustrating when I teach how to use an online tool, and then face a round of questions asking exactly what I just taught. I have to admit, I have social networking sites up all day in the newsroom, but this is different… I’m trying to teach these students something. 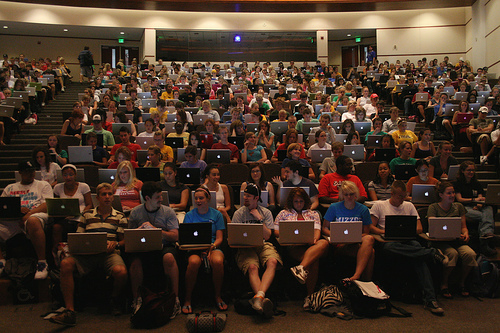 Here’s the thing – I’m willing to allow laptops, if I know students are taking notes. But I’m not always convinced that they are. In response to the questions asking exactly what you just taught, I suggest the following response: “Could I ask a student who was listening to answer that question?” That way you give someone (a keener) a chance to shine and it makes it clear to the multitasker that s/he needs to pay attention to this task. We just talked about it, pay attention and don’t make me repeat it just because you chose not to pay attention because that’s not fair to everyone else who is paying attention. I’ve been out of post-secondary classrooms for two decades now I admit but I just don’t see how nowadays – especially given the subject matter – you could possibly ban laptops/tablets. It would be like art history without a projector. There must be other means at your disposal to keep students focussed. Assign a (higher) percentage of the grade to class participation. Ask that exam questions be answered based on the class discussions and lecture material. In the end, though, it’s university, they’re grown-ups, and if they cannot apply themselves they’ll have to live with the consequences. Exactly what I think @cmkl. I’m not ready to ban them just yet… but I think as part of their mark is professionalism… this may be the place to reward attentiveness. Hmmm. I think there’s a pretty easy way for profs to deal with laptops in the classroom. Surely a prof can tell right away when students are ignoring the lecture/discussion by surfing around on Facebook or whatever. They’re trackpadding or staring at their screen without typing anything. When I look around the room, it’s comically obvious who’s taking notes and who isn’t. So profs should make students a deal at the beginning of the term. They can have their laptops in class, but with the understanding that at any moment you can ask them to respond to what was just said, or even just repeat the point back. Just something simple to test basic attentiveness. If they consistently fail, the professionalism mark is gone. 10% of their grade, or even higher. You could catch students at this so easily. After a few classes of singling students out, I could name at least 3 or 4 of my friends who’d be so terrorized they’d stop surfing around during lectures (which they currently do constantly.) You likely wouldn’t even have to dock professionalism marks by the end…as long as the threat is credible. I suppose this wouldn’t work so well during classes with huge lecture halls, but in smaller class sizes, this seems like a good solution that lets laptops stay. Also, I would find it hilarious watching people get busted.